Stanosim (stanozolol) is classified as an anabolic, exhibiting low androgenic side effects. It's anabolic properties however are not dramatic and is often used in combination with many other steroids, most commonly during cutting cycles when water and fat retention are a major concern. 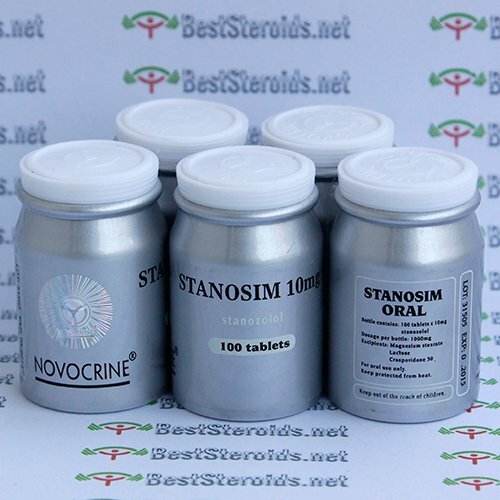 Stanosim is classified as an anabolic, exhibiting low androgenic side effects. Stanosim is not capable of converting into estrogen so an antiestrogen is not necessary when using this steroid, gynecomastia is not a concern even among the most sensitive individuals. Stanosim produces a lean, quality look with no fear of excess subcutaneous fluid retention. It can make distinctly visible gains in hard, defined quality muscles. It is very effective and it''s anabolic properties however are not dramatic but permanent and is often used in combination with other drugs, most commonly during cutting cycles when water and fat retention are a major concern. This product really made a difference. My muscled started becoming more toned while before this was difficult for me and I couldn't get the desired "ripped" effect I wanted. But this product worked great and I would recommend it to anyone looking to lean down and achive shredded effect. I started taking it 5 weeks ago have 2 more weeks to go. 50mg everyday along with some sust 350. I have abs for the first time in my life at 195 lbs. I've never even been 195 lbs. after 5 weeks i had veins popping everywhere and looked amazing. i will order again without a doubt.